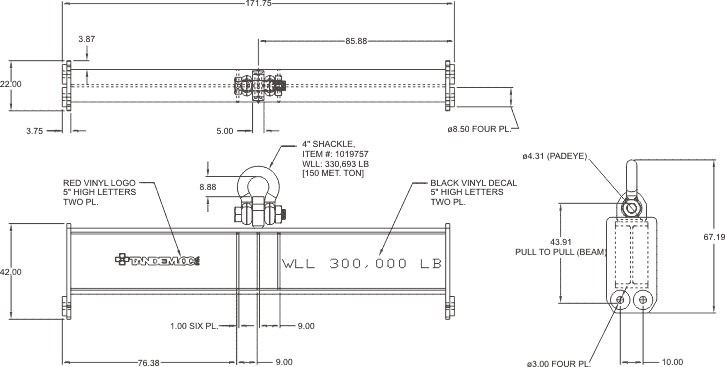 Lift Beam with Fixed Pad Eyes, 171.75"
Tandemloc's customer required a lift beam that could not only lift a ship deck at four lift points, but one that could also handle an extremely heavy load. This stout lift beam with a 300,000 lb working capacity. Tested with Tandemloc's versatile (pat pending) test machine, this load was easily achieved. Other manufacturers would have to jump through hoops to handle this level of testing load. For us, it's just another day at the office. Tandemloc is the cost effective source for heavy lift applications! STANDARDS: Specification #EAD21000A applies. Designed to meet or exceed ASME B30.20, & BTH-1, Design Cat. B, Service Class 0.